We are gearing up for our convention season month long offers so we thought as it was a Thursday we would share with you all some eye candy and a sneak peek as well. Ain't that just marvellous! 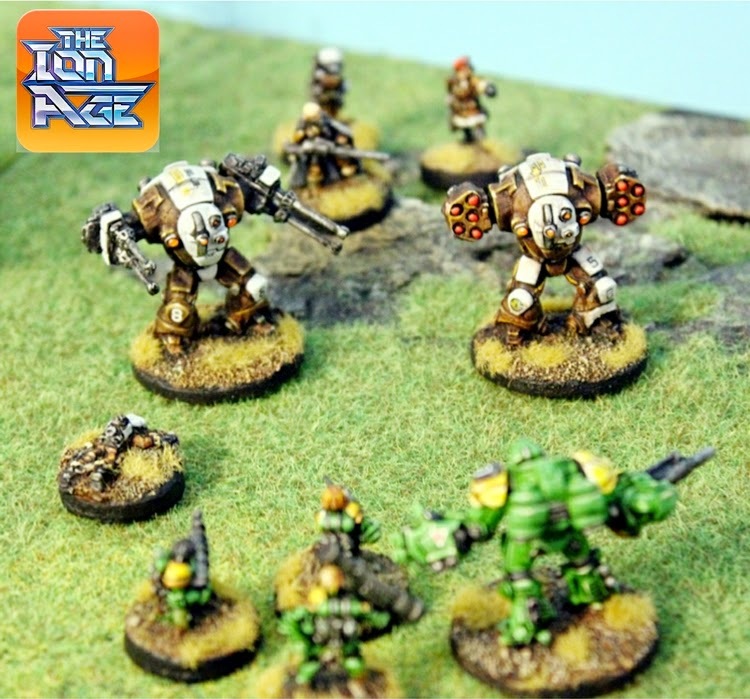 We do not do many pure visual postings on the blog but this one ties together several things that are in the immediate future of all IonFans and 15mm science fiction wargamers too. Namely the coming posts about Patrol Angis and the near to release Planetary Militia Battlesuits. Holding the heights. Yordist Knights and Espatan Moth 88. I have placed a caption on each image but it is the one at the header of this post that will grab your attention the most. A pair of Steornede Battlesuits the heaviest infantry open to Planetary Militia commanders on the ground such as in the campaign for Camarthen Prime against the Shia Khan Empire. A brother to the elegant Duxis and the workhorse Havelock battlesuits. Lacking a gauntlet or hand these battlesuits are pure mobile fire support armed with a pair of Moth 88 twin barrel cannons or a pair of Anda Missile Pods. They have a really rather different look as well which is what we wanted for the Planetary Militia with various low light and infra-red lenses for urban and night fighting and high power lights for illumination. Backing up PM Squads and light vehicles. You can see more about Planetary Defence Forces HERE. We will be releasing these battlesuits before the end of March 2015 so plan accordingly if you like them. I think Sam Croes did a super job on these mechanical ogres. 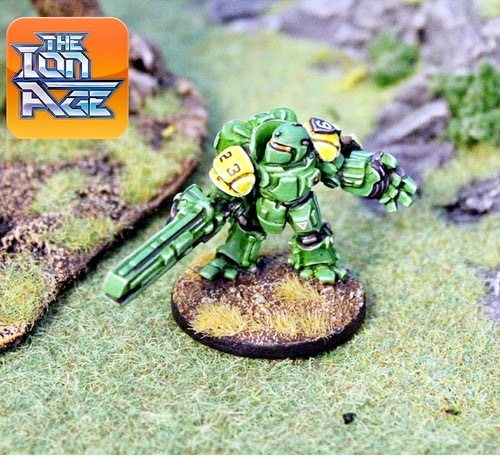 The other pictures show Retained Knights along with an Espaten Portable Weapon and a Duxis Battlesuit in the light green and yellow colour schemes of the League of Yordan. 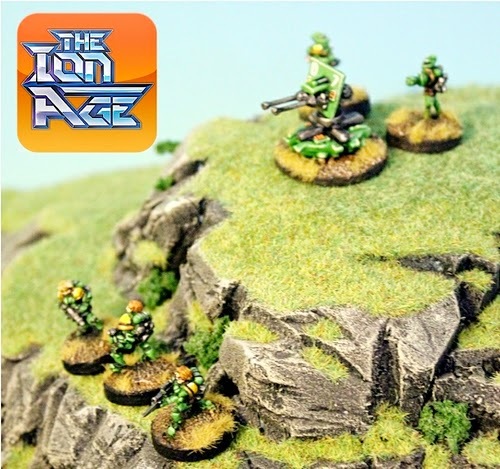 We have been playing Patrol Angis with these and indeed all of these miniatures will be featuring in the excellent value Patrol Angis game set and there will be more on this next week. We know you are used to the white and red of the Prydian Army but on Dando's World the League of Yordan is dominant and its great to see these miniatures in different colours. We hope you like them. 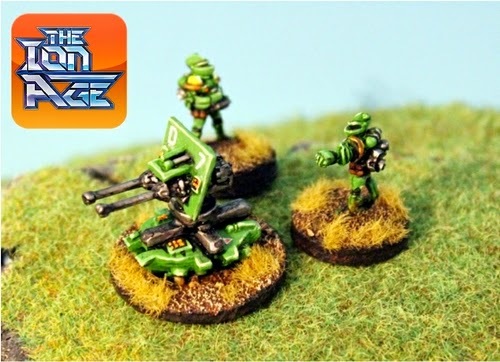 I have an off-topic question: What basing sizes do you use for the 15mm range for your "house" miniatures seen on the Ion Age website. Foot models and bigger battle suits? I recently acquired some mixed Ion Age troops from the NobleKnight store in the US and want to get started on them proper with nice basing. Thanks for your comment. We are using the basing sizing that applies to all of the games we are and will be doing. Starting with Patrol Angis. Basing for Infantry of all types is 20mm round. Basing for Battlesuits and Bikes is 30mm round this includes Khanate Warlords as they are mortal battlesuits if you like. Noble Knight Games in the USA carries the whole line and offer excellent service. Those base sizes will work. We will keep up the good work and more awesome to come next week!